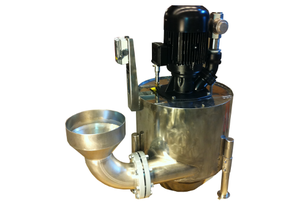 Self-cleaning Vortex return tank (pump back station). In full-flow the fluid containing cutting chips or grinding sludge from the machine operation flows in to the return tank. When the fluid rises to a preset level, the vortex pump starts and pumps the fluid to the central coolant management system. The unit comes in standard edition or customized according to the machine tool coolant outlet and the on-site condition. Capacity range: 100-3.000 liters/min. Depending on model.